100 Jew leaders: Linda Sarsour is kosher! On May 31, 2017, more than 100 ‘moderate’ American Jew leaders issued a letter condemning attacks on Linda Sarsour, executive director of the Brooklyn-based Arab American Association of New York whose speech at a City University of New York graduation on Thursday pissed off several Israel Hasbara morons such as Brigitte Gabriel, Ayaan Hirsi Ali, Pamela Geller , Milo Yiannopoulos, David Wood, etc. On May 24, 2017, Jewish Newsweek called Sarsour: To0 extreme for CUNY. The signatories to the letter are not anti-Israel or self-hating Jews – but they believe that Jewish occupation of Palestine within pre-1967 borders is only kosher. Many of them such as J-Street had supported former president Barack Obama’s nuclear agreement with Iran believing that a non-nuclear Iran would never threaten nuclear Israel. 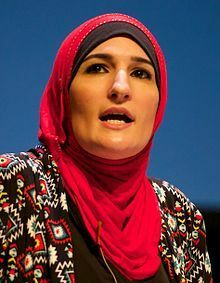 Linda Sarsour, is considered to be anti-Netanyahu over Zionist fascism and anti-Trump over his disdain of women. She equates anti-Semitism with Islamophobia despite the fact that Zionist Jewish groups are behind the Islamophobia in the West, while antisemitism was hardly found in Muslim world until the creation of Israel. During her speech at CUNY, Sarsour urged the students to fight all forms of injustices, racism, and phobia, rather being bystanders. “The only way to do this is to organize intersectionally and holistically, racism, poverty, police brutality, Islamophobia, antisemitism, homophobia and other social ills that must be confronted,” she said. Sarsour avoided talking about US-Israel fascism in the West Bank, Gaza, Syria, and Lebanon during her speech. Sarsour was one of the leaders of the women’s march on Washington in January, 2017 and helped raise US$110,000 to repair a vandalized Jewish cemetery in Missouri which Donald Trump had blamed on Jews. Jewish Lobby has accused Sarsour of being a supporter the so-called Boycott, Divestment and Sanctions (BDS) movement against Israel which in fact is one of Israel’s gatekeepers. She is also accused of tweeting that nothing is creepier than Zionism and argued that Zionists could not also be feminists. Last month, Zionist Organization of America president Morton Klein called on N.Y. Governor Andrew Cuomo to intervene in the planned event at City College’s School of Public Health to be addressed by Linda Sarsour. Brooklyn Councilman Jumaane Williams (D-Flatbush) said Sarsour was one of the Time 100 people and accused Klein of mixing religion and politics. Sarsour has her critics among Muslims too. For example Muslim blogger Jonathan Azaziah has called her a Zionist poodle. “She might as well just convert to Judaism. And truth be told, with her services rendered to the Kehilla in her tirades of hasbara against Syria and Yemen, her defense of the murderous Saudi regime, her commitment to the existence of ‘Israel’, her censorship of all discussion on Palestine at the #WomensMarch and now THIS… She’s practically a member of The Tribe already,” said Azaiah.